Currently on display in the museum’s Prime Ministers of Australia exhibition is former Prime Minister Kevin Rudd’s boots. The black leather RM Williams riding boots were worn by Kevin Rudd when he tabled a motion in the Commonwealth Parliament on 13 February 2008 apologising to the Stolen Generations for the forced removal of Indigenous children from their families. Both size 9G boots show signs of wear from use and have some water stains on the upper leather and mud stains (source unknown) around their lower edge. The boots are displayed along with the orange Hugo Boss silk necktie also worn by Kevin Rudd while delivering the apology speech. The apology was seen by many Australians, both Indigenous and non-Indigenous as an important symbolic step towards future reconciliation. The Apology to Australia’s Indigenous peoples was the culmination of a debate that began with the release of the Bringing them home report produced by the Human Rights and Equal Opportunity Commission in 1997. The apology speech was broadcast live across Australia, with large crowds watching outdoors public broadcasts in Melbourne, Adelaide and outside Parliament House in Canberra. Seated in parliament for the apology speech were 17 members of the Stolen Generation and former prime ministers Whitlam, Fraser, Hawke, Keating and former Governor-General Sir William Deane. After the ceremony the House of Representatives unanimously adopted the proposed motion and later that same day an identical motion for an apology was considered and passed by the Senate. In a speech after losing the prime ministership on 24 June 2010, Kevin Rudd cited the Apology as one of his proudest achievements. The RM Williams riding boots in particular are a significant part of Kevin Rudd’s personal image. As prime minister, Kevin Rudd wore riding boots all the time regardless of whether the occasion or event was formal or informal. Kevin Rudd was pictured wearing black RM Williams riding boots while meeting President Barack Obama at the G20 Summit in London in March 2009. The boots may also reflect Kevin Rudd’s rural background and ongoing interest in horse riding as a pastime. RM Williams boots are viewed as an Australian icon, a product that is tough and durable for outback conditions and now quite possibly the footwear of choice for those with prime ministerial aspirations to be seen wearing. Both opposition leader Tony Abbott and former leader Malcolm Turnbull have been pictured regularly wearing RM Williams boots and former treasurer Peter Costello was known as an early adopter of the footwear. As well as being worn by a number of prominent Australian politicians, RM Williams boots have been presented as gifts to international leaders. Kevin Rudd presented Indonesian President Susilo Bambang Yudhoyono with a pair of the boots in Bali in 2008 and John Howard presented both Bill Clinton and George W. Bush with boots during visits. 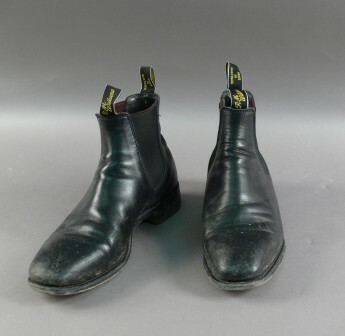 The boots and tie, along with a copy of the Apology speech can be viewed in the Prime Ministers of Australia exhibition, along with a number of other objects depicting the personal and political lives of Australian prime ministers.